The quick answer to this question is simply better optimization. When you think about optimizing content, it’s likely that you focus on the text-based content first and foremost. What if we were to tell you, that ranking higher in Google Image Search can help you increase traffic, potentially reach more clients and spread your brand reach? Sounds good at the moment, and in reality it’s a few tweaks to your existing content that can dramatically improve your rankings and hit on all these points. Ranking higher in Google images is useful for personal promotion with photography, product images, blog post and website images. 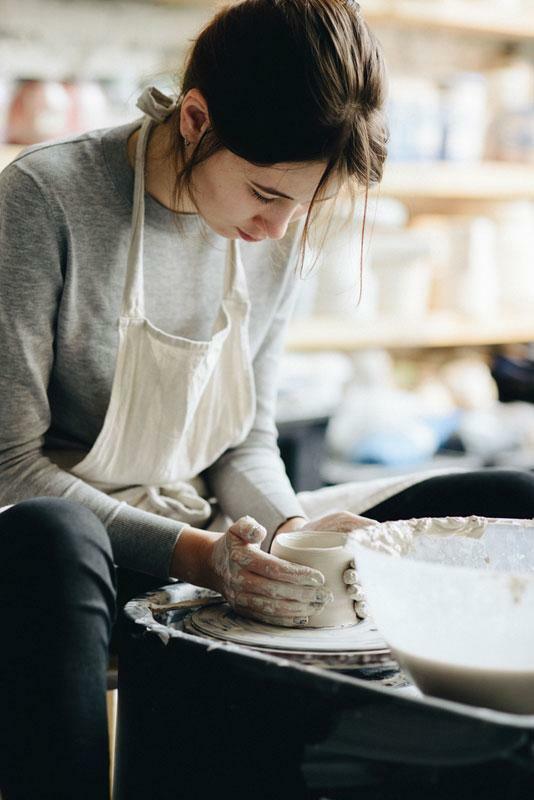 Anyone working online should have high-quality images, decent exposure on social media, and use Google Image Search to attract customers with SEO optimized photos and visual content in general. We get into the how and why of this statement, with examples of images optimization so that we can get your images (regardless of the nature of your online activity) to be found on the first pages of google. Although it may seem like a task that won’t take much time, it certainly will if you noticed based on your analytics that you aren’t ranking for much on Google Image Search. The real value of ranking on the first pages of Google Image Search is increased exposure, and overall help enhance the performance of metrics of your site. We always start with, “who cares?” Based on personal experience, I can say that it’s much more difficult to optimize an article with common search terms to rank on the first page of Google, and doing so for Google Image Search requires much less effort and quickly demonstrates improved results. The end result being higher click through rates and traffic to your content. This happens also in light of the fact that ¼ of all search traffic comes from Google Images. Just think back to the many times you decided to take the visual route and search for something on Google Images only to end up on the exact page you need because of it. 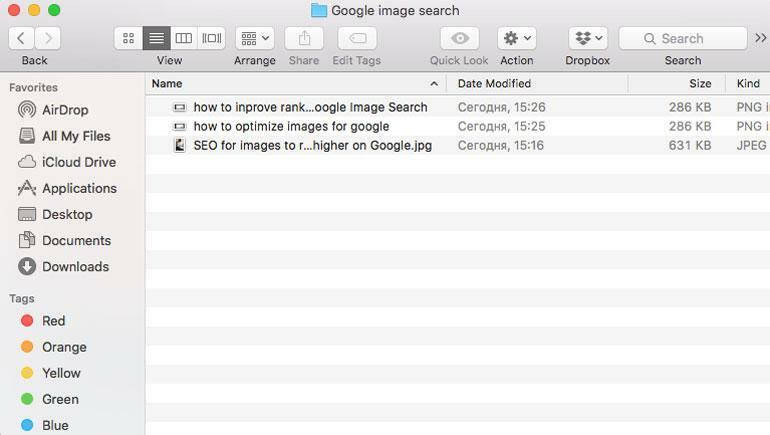 Applying the same key steps to optimizing images for Google Image Search, you can easily take control of brand narrative or simply first impressions. We’ll keep it short. Google actually can’t “crawl” images he way it does with text. To help Google understand the nature of the visual content, images have to be optimized with alt tags to describe exactly what’s portrayed in context. The solution is simple, and we broke it down into simple steps that you can strategically apply to your existing content today. You’ve go to work with what you have. These steps include every single ranking factor for Google Image Search, and it’s important to address all of them for improved results on Google. If you’re uploading images with file names like IMG_4532, you’re doing yourself an injustice. When you save images on your computer, make it a habit to rename them in a way that is descriptive of the content of the image. Hands down, no one is hoping to find an HD wallpaper of your product. Make it a habit to also compress your images to something reasonable, ideally under 100kb. This ensures better load speed and better user experience. Be sure your images are the standard 16:9 or 4:3, or simply perfect squares. Metadata is an extremely important ranking factor. This aspect deserves more attention – meta title, alt text, caption, and description. The more detailed and descriptive the details, the more chances you have for ranking in something quite niche and directing people to the right content. Pay particular attention to the alt text of your image, because it’s the factor that weighs in the most to search rankings on Google. Title: The title of your photos is no the same as the file name. This option on WordPress is what people see at the bottom of their screen when they hover over an image. It’s also what shows up on Pinterest if people decide to pin your post. Title tags should have your main keywords but not be overly descriptive because you can do so with the alt tags. Alt tags: This is what exponentially improves the discoverability of your images on Google Image Search. “Alt” stands for alternative text which helps users that can’t display the images. Google bots concentrate on the alt attribute to categorize your image. Naturally, the alt text should be very descriptive of what exactly the image depicts. Captions: They say there is no correlation between image captions and rankings on Google Images. However, they’re an important part of supporting content that does help search engines understand better what your images are about. Image captions are also there for everyone to see, whereas the titles, alt text, and image names are hidden from users. There you have it. The three important factors that weigh in to how your images are indexed and read by Google. Use alt tags to help Google understand what the nature of your content is, and make sure your metadata fits the nature of your business with the right keywords. Image engagement is something else that can help your images rank higher in Google image search. However, this point is quite self explanatory and the best thing you can do is find the right targeted keywords after thorough research. Another important factor that can help with Google Image Search rankings is hosted page elements such as the page URL, page title, and other supporting text on the website which can help Google understand context. This also happens to be one of the reasons stock images don’t rank as high in Google image search. There is little context and stock platforms function as their own search engines almost always independent of Google rankings unless specified with the name of the stock platform. 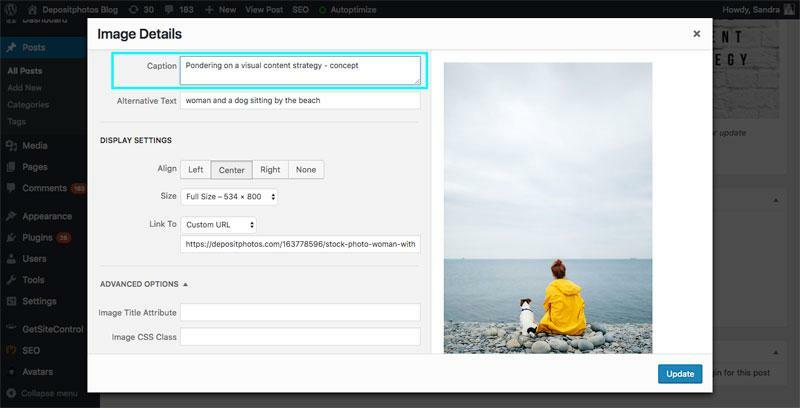 To carry on with the idea of image engagement, search goes beyond meta details. There’s also social media which can help you leverage that which you already have. Optimizing social media pages is another trick up your sleeve. This applies to social media networks like Facebook, Twitter, LinkedIn, and even Medium and Quora. If your social media profiles are heavily based on images, and these images rarely rank, it’s still a good idea to apply the basics to image optimization on those pages. Image engagement plays a role in Google Image Search rankings, and you want to make sure those images are optimized (just in case). To rank on the first page of Google, the secret is really about niche keywords. It’s worth your effort to have a brainstorm about the keywords you want to rank for. For example, if you’re a wedding photographer in Barcelona, you would want to rank for your name, but also “wedding photographer Barcelona”. This could help people looking for your services to find you based on images alone. You can user services such as Ahrefs to run your whole blog or website and see a detailed breakdown of your overall performance online, your rankings in Google, and in particular to see if your images rank at all on Google Image Search. With all this talk about rankings, the other significant factor is the quality of your visual content. Uploading images without any of the aforementioned steps with titles, alt tags, captions and descriptions, you’re not getting anywhere. The same is true for well optimized images that simply fall under the bar. Image optimization takes some time, but if you make it a habit for every single image in your product page or blog, for example, you can really reap all the benefits of higher rankings on Google Image Search. Once this happens, you’re opening up your business, blog or website to new users and maybe even new clients. Optimizing images for Google gives you that one more creative edge to reach new audiences.